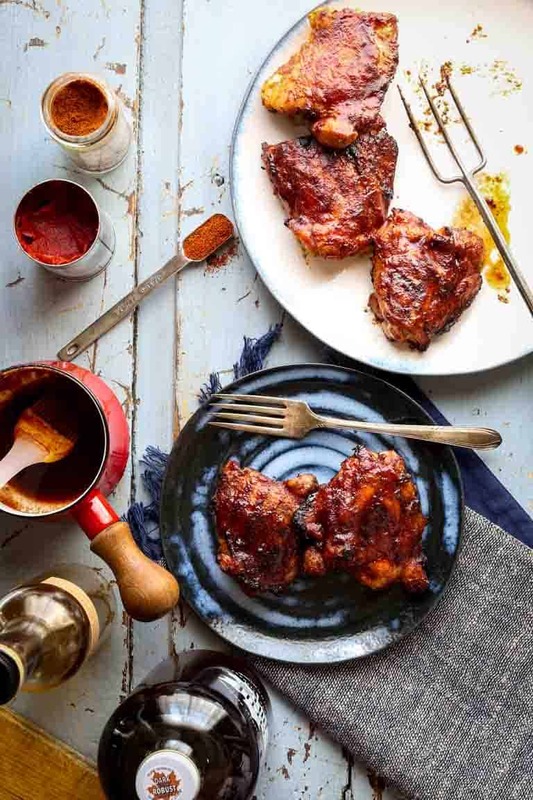 These simple grilled chicken thighs with refined sugar-free maple chipotle barbecue sauce are summer grilling perfection. The sauce is brushed on at the very end of grilling just to caramelize it a bit, but it doesn’t burn. 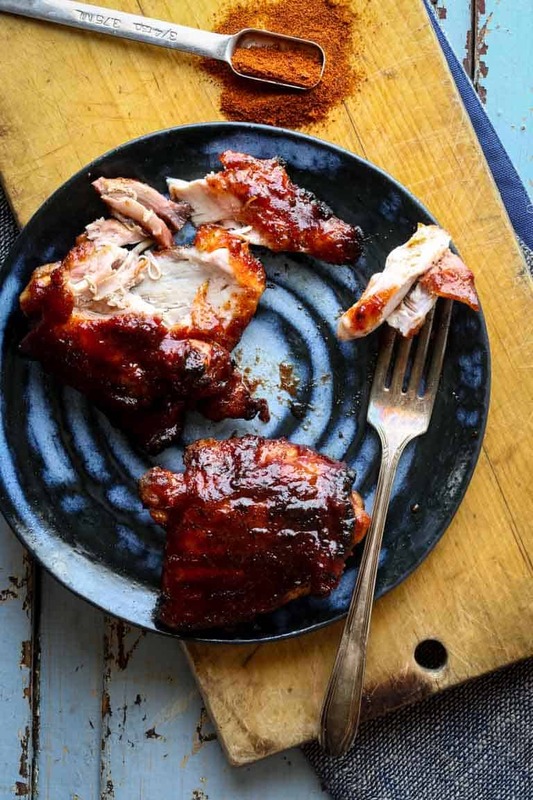 The sweet, tangy, tender, juicy and smoky results are smokin’ good! This healthy barbecue chicken is naturally gluten-free and paleo! Well hello, June. In my mind, when I hear June I think SUMMER!!! June is summer, right? I know the summer solstice isn’t for another three weeks, but in my little brain, June, July and August is summer. Please leave me a comment below and let me know if this is crazy talk. So anyhoo, if you’re with me, let’s say hello, summer! Oh summer, how I missed you and I am so glad you’re here! I have been dreaming of you and all of my summering favorite activities like grilling, drinking rose and sitting in the sun with family and friends. Going for runs with my daughter and taking the dog for long walks. Gah! Pause button. Happy place! Anyway, now that June is here, I am looking forward to spending time at the lake and relaxing in the sun. This will be my first summer not teaching fitness classes, so I am really excited to have a much more mellow weekend routine than years past. I have set myself some goals for things to accomplish this summer. Later in June and into July, I am actually planning to take some serious time off. It’ll be A FULL MONTH of no recipe testing or photography!! So that in and of itself is an accomplishment for this workaholic. It’s kind of scary, but I need it and it will be so good for me. Another goal is to take stand-up paddle boarding lessons. I got a touring board at the end of last summer, and took it out a bit. Since I am the kind of person that is all about good form, must be a BodyPump thing, I am kind of hung up about getting my stroke down before I set in bad habits. Then by the end of the summer, I want to try paddling all the way across the lake (it’s a mile across and 400 feet deep!) That goal terrifies me (even more than taking time off) but I am going for it. Also coming up in June, we are headed out west to embark on a two week family road trip. We’re starting in Denver, and doing a long meandering drive back to Vermont via the Telluride Bluegrass Festival and camping in the four corners. We’re even doing a two night a stop in Nashville on our way home to Vermont. I’ll be sharing on Instagram, so please follow along! I kind of feel like this trip is going to need its own hashtag. What do you think? If you have any good ideas for a unique hashtag, leave me a comment below. Also please share any thoughts on non screen activities for my girls for the long hours in the car. After my vacation I’ll be headed back into the kitchen to begin work on some new recipes for the blog and for clients as well. I am sure the rest will get my creative juices flowing again. 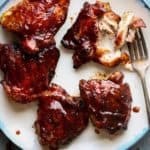 We’ve actually had this Healthy Barbecue Chicken with maple chipotle sauce a bunch already since the grill came out for the season, and I even tested it with boneless thighs since I knew the question would come up. I prefer it with the bone, so that’s what I recommend, but if you use boneless, the cook time will just be shorter. When making this recipe, make sure you remove the skin from the chicken. You’ll save 50 calories just like that. So that’s a good reason, but it also causes flare-ups, and the exterior texture of the chicken will be too crusty and charred. And one last note: the maple chipotle barbecue sauce goes on the chicken at the end of grilling. I did this after the chicken is cooked through and waited for a few spots to show charring. Just enough to caramelize the sugars in the maple syrup and give it that classic barbecued flavor, without making the chicken burnt and bitter. And absolutely no good barbecue meal would be complete without dessert… so make sure and check out this yummy No Bake Apple Pie by Allergylicious. It’s gluten free and vegan! Do you think of June as summer- even before the solstice? Any ideas for a hashtag for our road trip? Any suggestions for car activities for my girls? 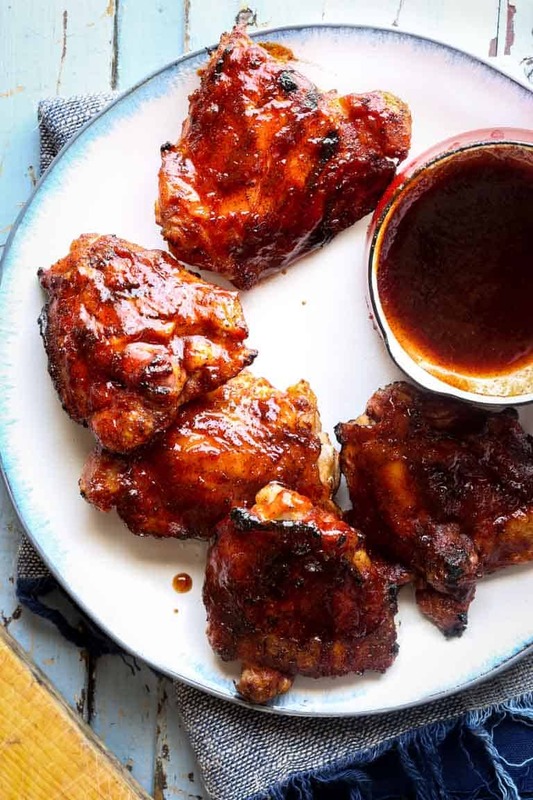 These healthy barbecue chicken thighs with refined sugar-free maple chipotle barbecue sauce are summer grilling perfection. They’re gluten-free and paleo! Whisk maple syrup, tomato paste, cider vinegar, chili powder, chipotle and granulated garlic in a medium bowl. Sprinkle salt and pepper all over the chicken. Soak a paper towel with oil and set near grill with tongs. Just before grilling, hold the oil soaked towel with tongs. Drag gently along grill grates, pulling toward you. Immediately add chicken to the oiled grill. Grill chicken, turning often, until the meat is cooked through to the bone and no-longer pink inside, 18 to 25 minutes. 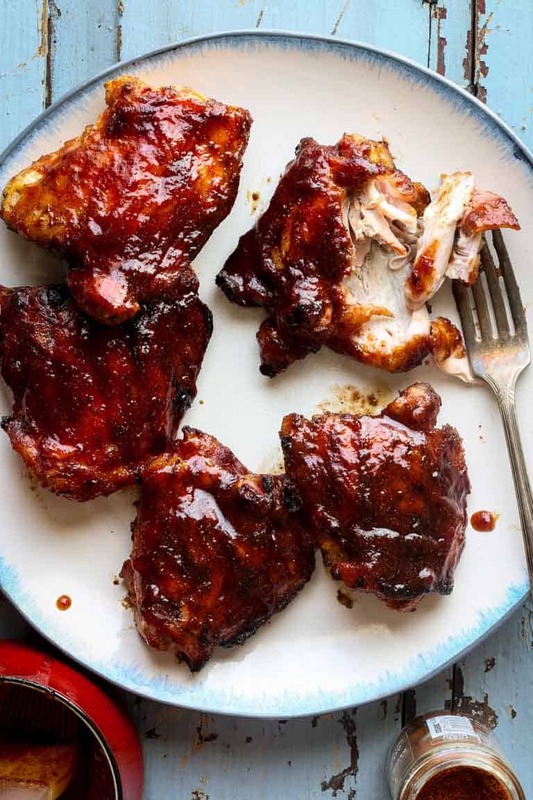 Brush barbecue sauce all over the tops side of the chicken, and turn over and allow the sauce to caramelize and char ever so slightly, 1 to 2 minutes. While it chars, brush barbecue sauce all over the other side of the chicken. Turn over again, to caramelize the second side. Remove from the grill to a serving platter or carving board and allow chicken to rest 4 to 6 minutes before serving. *Ingredient note: If you prefer to use boneless skinless chicken thighs, the cooking time will be 10 to 14 minutes total. Wow! I love this recipe. I am quite new to chipotle seasoning but I will be trying it pretty soon!Thanks for the inspiration! It is my favorite way to add heat because it also adds smokiness to recipes! A double win! What a great chicken barbecue recipe! I have all the ingredients for this … please excuse me while I run to pull chicken out of the freezer! Ha ha! I love to hear that! Thank you so much for coming by to say hello today Noel. That would be amazing! If you try it let me know Kelly! 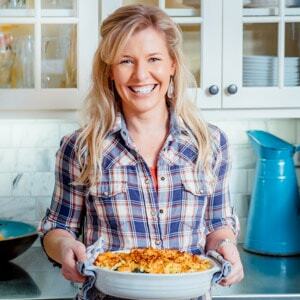 This recipe looks absolutely fabulous! I love maple in anything! And chipotle? Mmmmm. 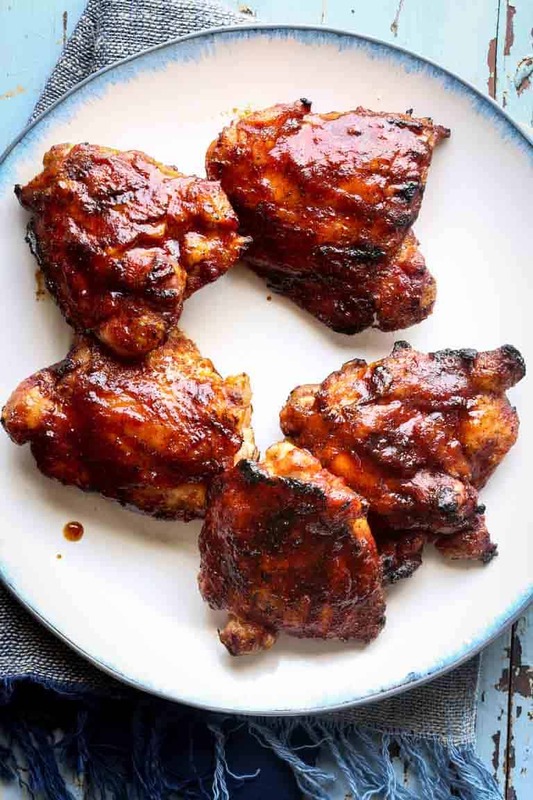 There is something so simple and satisfying about barbecued chicken and your sauce is definitely something I need to make! What a great combo of flavors! I totally agree that Barbecued chicken is a classic for a reason! Thanks for coming by and for the compliment Lisa. 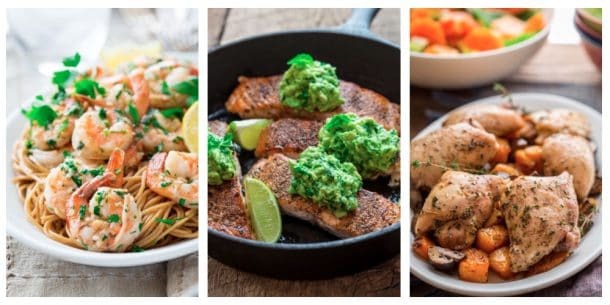 This recipe doesn’t appear to have enough liquid to make all the sauce that’s showing in the photos. 1/4 cup plus 3 Tbs. is all that is called for of liquid ingredients. Is something missing? BBQ season is over here in Montreal. Can I make this in the oven? YES! 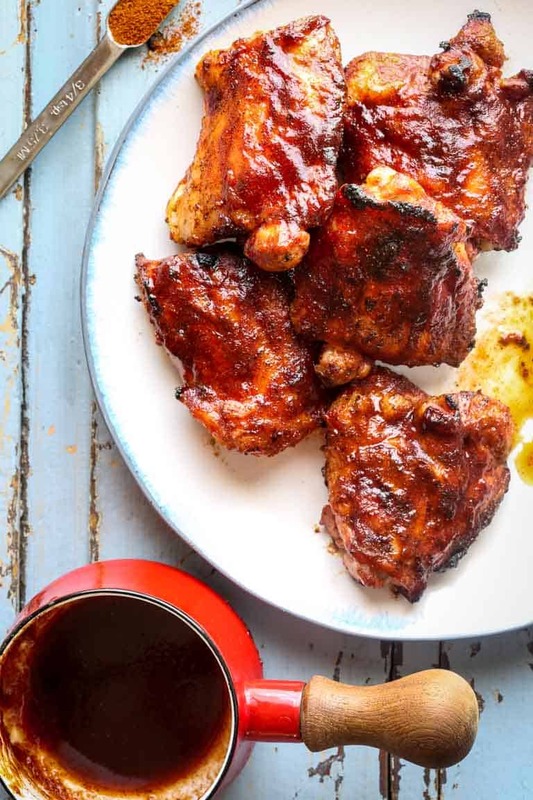 Sub the maple bbq for the mustard honey mixture and follow the instructions in this recipe https://www.healthyseasonalrecipes.com/5-ingredient-honey-mustard-chicken-thighs/ Enjoy! This is silly simple but OH SOOOOO GOOD. I up the ‘heat’ a bit, just personal taste. I don’t have chipotle piwder but I do have chipotle in adobo sauce. I know it would take it out of the whole 30 and/or paleo relm, but would the adobo be an ok sub? Or the chepotle chilis? You can chop up one of the chipotles and use that instead. Looks so simply delicious! The sauce is just what I’m looking for! Yum. 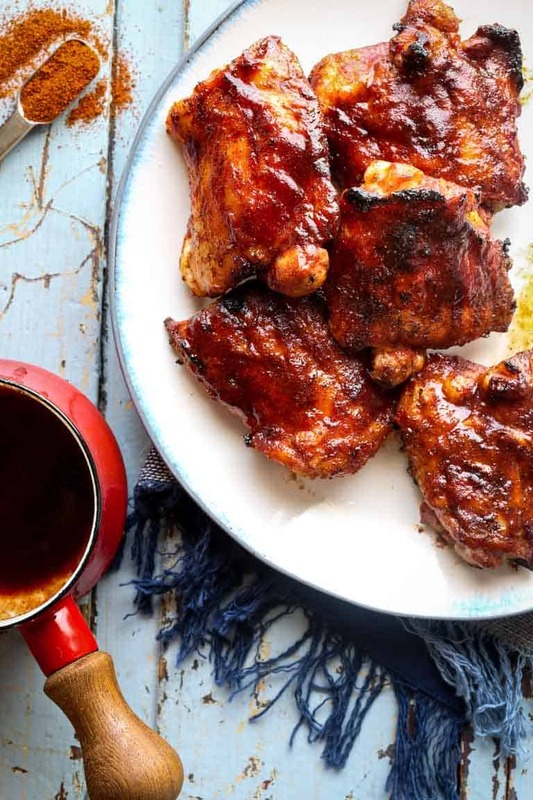 Chicken thighs aren’t normally what we have when we get chicken but I’m willing to ‘take one for the team’ to have this recipe. Great balance of flavors and perfect for this weekend’s grilling adventures. This chicken is perfectly saucy and I love all the spicy and smoky chili seasonings you added too. Yum! The sticky gooeyness of these is just amazing! Oh my, that sauce is amazing!